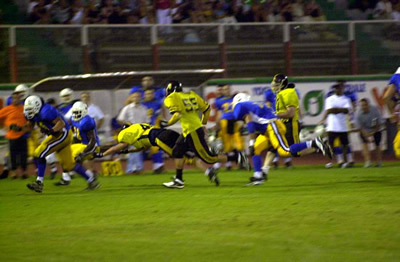 Former Stallions Adam Heming #65 and Luc Heming #69 are currently playing in the Italian League for the Ancona Dolphins. Also playing in Europe is former player Kevin Taylor. Kevin is playing in Finland. We are currently tracking down a picture of Kevin. 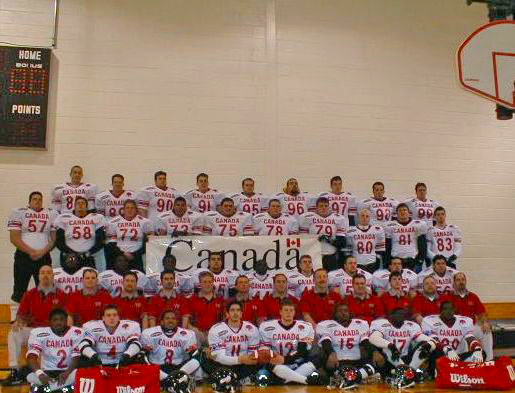 Canada participated for the first time in the Global JR. Football Championship in Atlanta Georgia. This 4th annual event is held during Super Bowl week and is an official event of the Super Bowl. Four countries were represented, Panama, Europe the defending champions, United States and Canada. The Canadian Team was made up of 19 & under players from Quebec and Ontario. 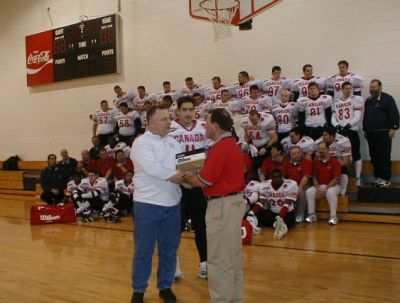 The Ontario players were chosen from the Ontario Varsity Football League. The Huronia Stallions are very proud that Tom Turnbull was chosen to represent Canada. 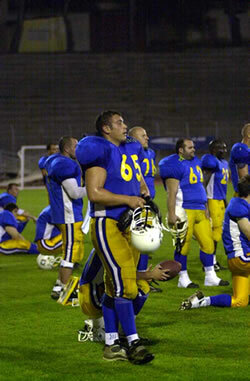 Tom was the starting right guard on a very large offensive line. Canada opened the tournament by playing Team USA. Know one gave Canada a chance. The game was played in very winter weather unfamiliar for Georgia very familiar for Canada. Canada shocked the football community by beating Team USA 13-6. Canada would go on to play Team Europe in the championship. The championship was played during an ice storm, Canada defeated a strong European team 7 to 6 to capture the World championship. 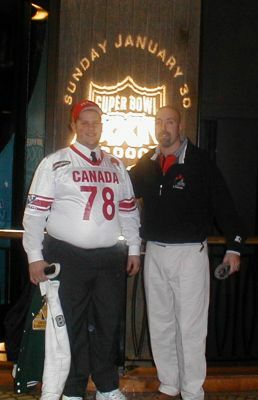 Canada will defend its title during Super Bowl XXXVI January 28, 2001.